Credit: Giannis Mpourmpakis/Reprinted with permission from ACS Catalysis. Copyright 2018 American Chemical Society. PITTSBURGH (December 12, 2018) … Olefins are simple compounds of hydrogen and carbon but represent the building blocks of chemistry, and are vital for the synthesis of materials from polymers and plastics to petrochemicals. However, olefin production requires the use of nonrenewable fossil fuels, energy intensive “cracking” facilities, and limited production control. 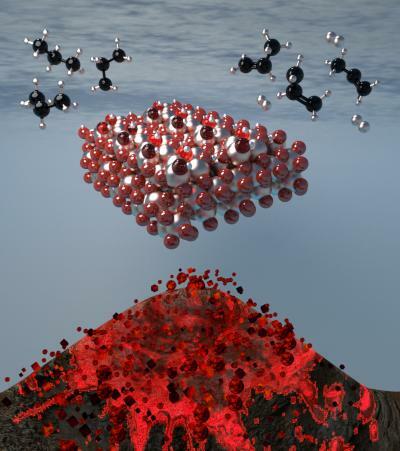 New research from the University of Pittsburgh’s Swanson School of Engineering has introduced a method to effectively screen different catalysts that convert light alkanes to olefins. With light alkanes being abundant in the Marcellus and Utica shale reserves, this methodology may provide a more economical solution for olefins production. Their research, “Structure-Activity Relationships in Alkane Dehydrogenation on γ-Al2O3: Site-Dependent Reactions” was recently featured on the cover of ACS Catalysis (DOI: 10.1021/acscatal.8b03484). Lead investigator is Giannis Mpourmpakis, the Bicentennial Alumni Faculty Fellow and Assistant Professor of Chemical and Petroleum Engineering at the Swanson School, and co-authors Mudit Dixit, PhD and Pavlo Kostetskyy, postdoctoral fellow at Northwestern University who earned his PhD in Dr. Mpourmpakis’ CANELa lab. According to Dr. Mpourmpakis, determining exactly how the alkane dehydrogenation activity depends on the exact type of different sites present on the surface of metal oxides has been difficult, in part because of the diversity of the many sites. His lab applied computational chemistry and mathematical modeling tools to predict how alkane dehydrogenation mechanisms and catalytic activity change on the different sites of the oxides. The American Chemical Society Petroleum Research Fund (ACS-PRF, 56989-DNI5) supported this research. Computational support was provided by the Center for Research Computing at the University of Pittsburgh, and the NSF Extreme Science and Engineering Discovery Environment.